Effective Aikido Moves to Build Your Confidence! Do You want to learn effective Aikido moves that can instill confidence in your ability to defend yourself in times of need? Often before a physical attack, comes an aggressive verbal attack, and it can shock you. When you are being verbally attacked, it can be very intimidating, and in fact, can completely freeze you in your tracks. It is nothing like the relaxed training you experience in the comfort of a nice cosy dojo (training hall). In the dojo you may be practising many complex techniques, that are very effective... in that setting. But, unless adapted, are unlikely to work in the street! Well, in the dojo, the fear level is minimised, and you may not have any adrenaline flowing. But in the street you will experience a surge of adrenaline coursing through your veins. You will be unable to think clearly enough to perform a series of complex moves. It is essential to have a few easy Aikido moves, in your mind, ready for the unexpected. A vicious thug needs to be controlled quickly, efficiently and effectively. This way you will have a lot more chance of escaping. but in reality - are NOT! It is far better to be realistic than get badly hurt! So, what are the easy aikido moves that will protect you in times of need? Well, obviously they will not be fancy, flash Aikido moves, in fact, you will want to focus on the most simple Aikido moves possible. I will tell you in a moment but first, you need to think about what you want to achieve with these easy Aikido moves. So what is the aim? You don't want to be verbally or physically attacked... right? 1 - Don't be there in the first place... this works! 2 - Avoid going into dangerous areas... no dark alleys, underpasses, near pubs or clubs or anywhere else you may be surprised. 3 - Treat everyone you meet with respect. This will greatly reduce the odds of getting into an argument that leads to trouble. 4 - If verbally attacked, then what is it that they want from you? If you can immediately give it to them, then do so. Be agreeable, and help them through their wave of anger. 5 - Of course, you can always slowly back away, get distance, turn and walk or run. Aikido Success Blueprint offers you a gold-mine of wisdom on how to step on the fast track to quickly develop your aikido skills. The subject of practical self defense, has been examined by many martial arts experts. 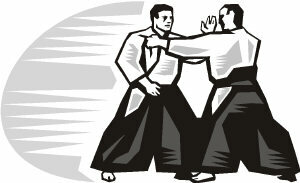 Many have high dan grades in a variety of martial arts and work in security, as bodyguards, club doormen, millitary etc. This has been proven time and again as the best method to minimise the damage, to you, and your attacker. After all, the attacker, in the moment, wants to seriously hurt you. What is a pre-emptive strike? Well, the aim is shock the attacker, just at the moment they are about to launch their attack. This can be a distracting atemi strike to a nerve centre, as used in Aikido. OR, if absolutely necessary, a full blow to completely incapacitate your attacker. You must use this pre-emptive strike at the right time. If you panic and do it too soon, you may be accused of attacking them, and rightly so. If you wait too long you may be attacked before you can use it. Do not use a clenched fist, unless you have been trained properly how to strike this way. It often has the effect of breaking the bones in your hands when bone meets bone. So an open hand is best, using the palm, or the 'karate strike' fleshy part on the side of the hand. Or as in Aikido atemi a back of the hand flick, between the eyes, only aimed to distract and not badly hurt them. Easy Aikido moves include these distracting atemi strikes. Often, this will give you the time to unbalance them, and escape quickly. There are many principles in the art of Aikido that can be adapted into easy Aikido moves for street effective self defense. You will learn many fascinating ways of dealing with other people. But it takes some time to be good enough to use this in a combat situation. Some of the moves I have found effective in my door and security work are iriminage and ushironage to sit them down quickly, sankajo to control them with pain, and standard aikido pins work very well on the ground. If you do use too much force, you may be prosecuted. But, if you don't use enough force, you may be seriously injured yourself... or worse! I recommend that you train sufficiently to be able to cause the maximum amount of damage, and then choose not to do it. My Aikido Success Blueprint is a unique collection that delivers the essential principles you need to Make Your Aikido Moves Effective It includes several Free Bonuses and 2 hours of Aiki Principles and Self Defence Principles video! My studies led me to the work of an impressive instructor, who has given me the tools to feel a lot more confident about using my Aikido skills. What Has Been Proven to Work! He has spent many years at the cutting edge of real combat, any of his students are doormen, security, millitary, and police who need the very best training to stay safe. He has developed a fantastic curriculum of effective tools that will greatly enhance your ability for using Aikido in combat situations. His name is Master Russell Stutely, who is acknowledged as Europe's Leading Authority on the use of pressure points in the martial arts. He has been instrumental in dragging traditional martial arts into the 21st century. He is a regular columnist for Britain's most prestigious martial arts magazines, Martial Arts Illustrated, Traditional Karate and Combat. Russell is in constant demand on the seminar circuit, teaching his proven methods of the correct use of Pressure Points and Power in street self defence. In fact, I was so impressed that I took a very intensive training programme with Russell and in 2010 qualified as a Pressure Point Fighting Instructor. Pressure points don't work... do they? OR, if you are brave enough... visit Master Stutely!